"Jim Crow," from the song "Jump Jim Crow" by the blackface minstrel Thomas Dartmouth Rice, is a term used for the social customs, policies, and laws that maintained racial hierarchies in the U.S. between the end of Reconstruction (1877) and the Civil Rights Movement of the 1950s and 60s. During the Jim Crow period, which coincided with a boom in the children's literature industry, many books, toys, comics, cartoons, and other children's materials asserted, sometimes subtly and sometimes overtly, the inferiority of African Americans. Here we have begun to collect a selection of these materials. We will add more as our project develops. Frances Trego Montgomery, who also published under the name of F. G. Wheeler, was a Midwestern author of children’s books in the early twentieth century. She is most famous for her books about a mischievous goat called Billy Whiskers; the series was a favorite of a young John F. Kennedy. 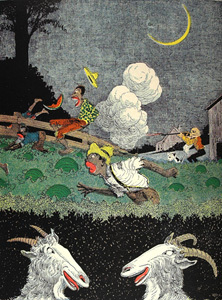 In Billy Whiskers in the South, the goat travels to the American South where he encounters a number of racial caricatures. Peter Newell was an innovative illustrator who worked in the beginning of the twentieth century. Known for his playful use of physical form, such as the hole drilled through The Hole Book, Newell casually accepted racial caricatures as unproblematic, as evidenced in his illustrations here.